Mechanical keyboards are a niche market that usually caters to gamers although many people who spend a lot of time writing have found them superior to the cheaper standard keyboards. Gamers love them because they are durable, have excellent response times, and give feedback through the keys. The sensation of feeling a key when pressed and the click they make gives an immediate verification that a key has done what it is supposed to. Many writers use them to help eliminate typos and errors. Mechanical keyboards give a feedback to a user that a standard keyboard can’t match. One of the problems with mechanical keyboards is that there are few wireless ones which most people have become accustom too. With that said there are some wireless mechanical keyboards on the market. They do cost more than a wired one but have the advantage of not being tethered to a computer with a USB cord. Below is a list of wireless mechanical keyboards we have found. If you have found one that works for you comment below. As always be sure to read reviews on Amazon, forums, or elsewhere to be sure a unit is the right pick for you. The Velocifire VM02WS is a new unit for 2019 that uses Content Brown switches. Content Brown switches are almost the same as the Cherry MX Browns with a bit less of a tactile bump. The Content switches cost less but still are great key making the Velocifire VM02WS a good budget unit. It is wireless and uses a 2.4GHz USB dongle that starts working once plugged into a computer. It is also has a back light that can be turned on or off. The VM02WS is a great unit for someone new to mechanical keyboards or anyone looking for a good low-cost solution. The CORSAIR K63 is a nice keyboard that uses CHERRY MX switches. It has Bluetooth built-in for a wireless setup or can use a wired connection. The K63 is a great unit for those who like to use Cherry MX switches that works very well when gaming or simply typing. Logitech is a well known company that makes the Logitech G613 LIGHTSPEED mechanical keyboard. It uses the Romer-G switches which have a short travel to click the switch. It also can connect via Bluetooth for a completely wireless setup. There is no back light which keeps the battery life lasting much longer. For those who have a favorite type of switch such the as Brown or Blue the Romer-G switches may not feel right. The Logitech G613 is a good unit worth a look, be sure to read the reviews to see if it is a good fit for you. This Majestouch keyboard uses Cherry MX Blue switches and is a wireless or wired board. It has built-in Bluetooth 3.0 or can use a USB wired connection if needed. It is also compatible with most any device such as Windows 7, 8.1, and 10 as well as Macs. The Majestouch is a full size keyboard powered by two AA batteries. A Majestouch board with the same basic features as the one above but using black switches. It also uses Bluetooth 3.0 or a wired connection. The MINILA Air 67 is a wireless Majestouch keyboard that uses Cherry MX switches. This version is a mini wireless mechanical keyboard which makes it portable. Compatible with Windows, Macs, and Android devices. The XArmor has been available for a few years and has a solid reputation. It uses Cherry MX Brown switches and uses the 2.4 GHz frequency for a 15 foot wireless range. This keyboard uses mechanical blue switches. It is a well built unit that uses Bluetooth for wireless connection. The DREVO Calibur is a Bluetooth mechanical keyboard that can be bought with cherry Blue, Brown, Red, or Black switches. It is one of the more affordable options and has a back-light which can be set to different modes or shut off. If your computer does not have Bluetooth be sure to buy a compatible low cost Bluetooth dongle. DREVO has built many good gaming keyboard and now has the Calibur Mechanical Keyboard. It can use Bluetooth or be plugged in to a USB slot. Currently there is two options one for Blue Switches and another for Red Switches. The price is low compared to many other units making it worth a look. What to look for when buying a wireless mechanical keyboard. A mechanical keyboard differs from a standard keyboard in the switches that are used. While standard keyboard uses a electronic touch interface a mechanical one uses physical switches. 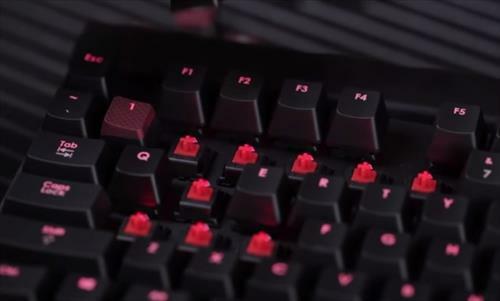 There are different switches that are used called Cherry MX Black, Cherry MX Red, Cherry MX Brown, Cherry MX Blue, Cherry MX Green, and Cherry MX Clear. Since each mechanical cherry switch is manufactured different they will give a different feel when pressed. 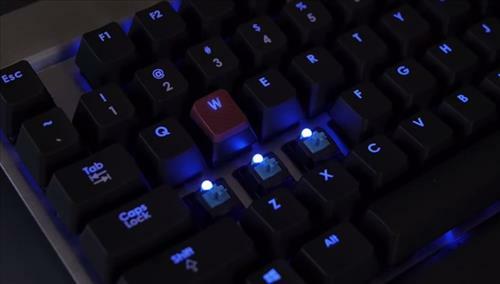 The most commonly used switches are the Cherry MX Blue followed by the Cherry MX Brown. Cherry MX Blue are used mainly by typist and programmers. The Cherry MX Blue switch makes a click when pressed that gives many writers a sensation of writing that has been lost with standard computer keyboards. Mx Blue switches require 50-60 grams of force to activate a switch which compared to a standard keyboard can vary widely from 25-90 grams of force. 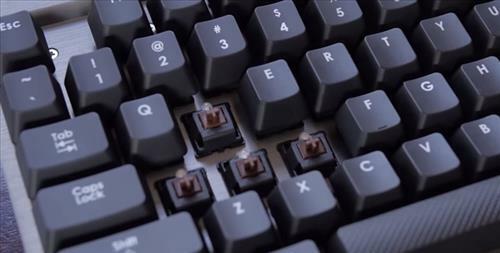 Cherry MX Brown are used mostly by gamers who like the response time of a key when it is pressed and the durability of the switch, which can take a pounding that would break a standard keyboard. They also do not have as much of an audible click as other switches, the click has a softer sound. They do require more force to push down on (45-55 grams of force) which does not bother gamers since the average gaming controllers require around 160 grams of force. Which wireless mechanical keyboard is right for you? Finding the right mechanical keyboard is a lot like finding the best of any peripheral device for your computer. What you plan to use the keyboard for such as gaming or simply typing will predict the type of one to buy. With that said many people fall in love with their mechanical keyboard and will stick to the type of switch used in the first one they buy. Much like the way most people buy their first iPhone or android smartphone they will simply stick with that version and tell everyone why that one is better. In the end a user will become accustomed to the type switch they first use, so there are many different opinions when it comes to the switches. Buying a mechanical keyboard very much depends on the person and the way they type. Some are heavy handed on a keyboard and press down hard on the keys while others press more gently and like a more easily pressed switch. The clicking sound that is made is also a consideration. Which one of this keyboards better to buy for MMO RPG games? I’d like a tenkeyless wireless mechanical keyboard which can also be wired, and has the ability to swap out the switches as well as the key caps. Can anyone recommend one? Mass Drop recently had an Royal Kludge RK61 60% bluetooth mechanical for sale. My problem is not wanting to have to hold down another key (FN) to access these pagination keys. I often find myself scrolling through lots of text using PG UP and DOWN. USB reliable single dongle that can be shared by both keyboard and mouse (like standard sets). wireless keyboard. They have not responded yet. I know what you mean wireless is important to many users especially a gamer who plays from a couch. Really tempted by the cheap RK 61 Anne clone (without the superfluous programmable backlight) but I would prefer some actual pagination keys instead of having to use Fn+ other keys to achieve the same. What would be awesome is some kind of Bluetooth HID adapter that can be retrofitted to an existing USB compatible keyboard. Just pop inside with a smallish li-ion and good to go. I’d buy them at once. I agree. I just got a Logitech MX master 2s mouse and love having the wire off my desk. If they had a full size backlit RGB keyboard with cherry MX brown with a micro USB or USB type C connector for charging, and could get over a month on a single charge I’d pay easily 300 for it. How do I love thee to buy the Varmillo… ten keyless keyboard wireless, but the problem is, it’s so so expensive. The price is $200+ in Amazon, wireless mechanical keyboard is so rare, maybe that’s why it cost that much. How come that most of the best selling mechanical keyboard in Amazon, doesn’t offer a wireless feature. I own two VM87M keyboards. It’s made of Varmilo, which is a PC accessory company from China. Its quality deserves its price. I got it from Chinese website taobao.com for $160 each (with Cherry MX green switch, back light blue LDE, free bluetooth 4.0 dongle). I have been using them for 4 months and I’m very satisfied. The only problem is that only Win10 supports Bluetooth 4.0 BLE and it doesn’t reconnect after rebooting sometimes. Everything else is good.